Writing Effective Essays. Why Colleges Ask For Essays College admission committees read thousands of applications, and most of the content reduces the. 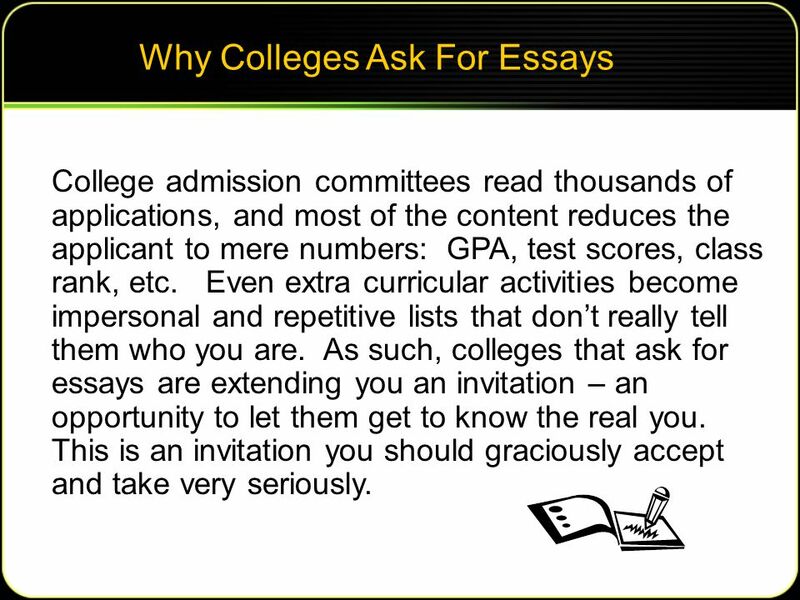 2 Why Colleges Ask For Essays College admission committees read thousands of applications, and most of the content reduces the applicant to mere numbers: GPA, test scores, class rank, etc. Even extra curricular activities become impersonal and repetitive lists that don’t really tell them who you are. As such, colleges that ask for essays are extending you an invitation – an opportunity to let them get to know the real you. This is an invitation you should graciously accept and take very seriously. 3 Essay Goals Demonstrate that you’ve mastered the English language. Prove that you can write clearly and well, as this is a strong indicator of college success. Personalize your application – give the inside view of you. Ensure that the admission staff get to know you a bit by telling a story that only you could tell. Show something else about you and/or how you see yourself. Show what is important to you, what has impacted you – in other words, what makes you YOU. 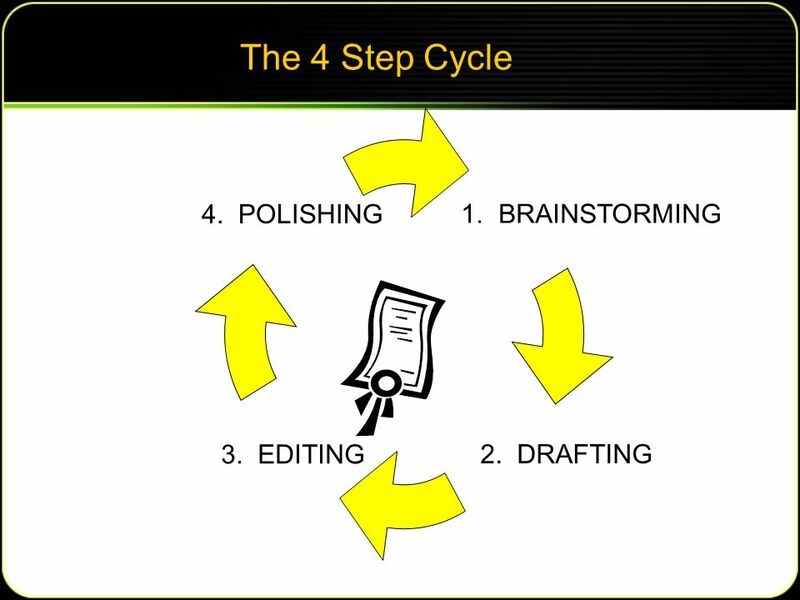 4 General Advice Give yourself plenty of time to develop your essay(s) – weeks, not days. Read examples of successful college admission essays. Be mindful of essay length requirements and other specific instructions. 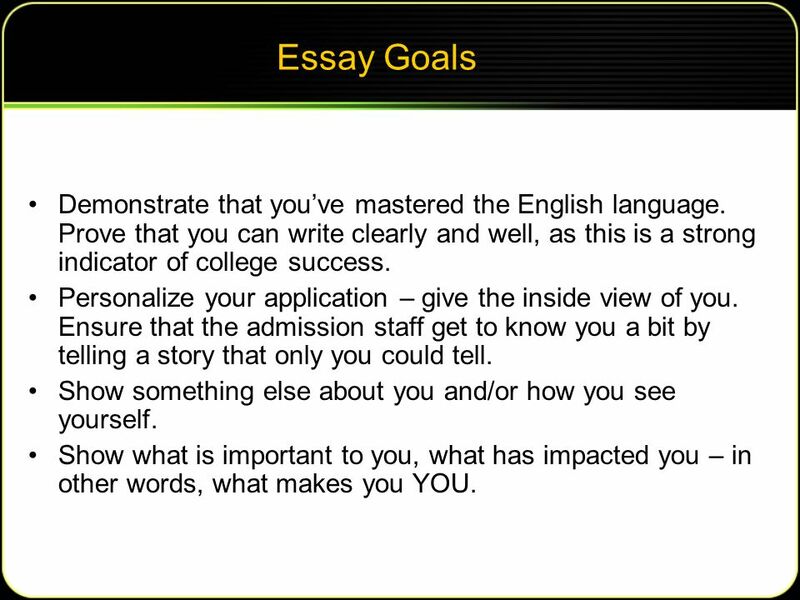 Remember, the goal is to tell the admissions officers something about who you are through the essay. Don’t try to do too much. Keep your focus narrow and personal – be specific. Use your own voice. Don’t try to say what you think they want to hear and don’t try to be someone you aren’t. Be cautious if you are trying something risky – poems, humor, gimmicks and taboo topics don’t often work. Do the work yourself. Others can help by proofreading and critiquing. 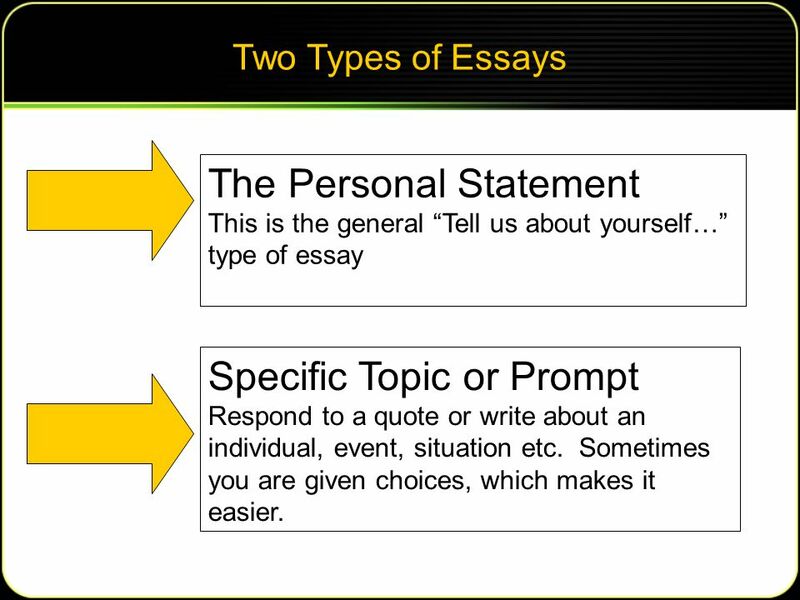 5 Two Types of Essays The Personal Statement This is the general “Tell us about yourself…” type of essay Specific Topic or Prompt Respond to a quote or write about an individual, event, situation etc. Sometimes you are given choices, which makes it easier. 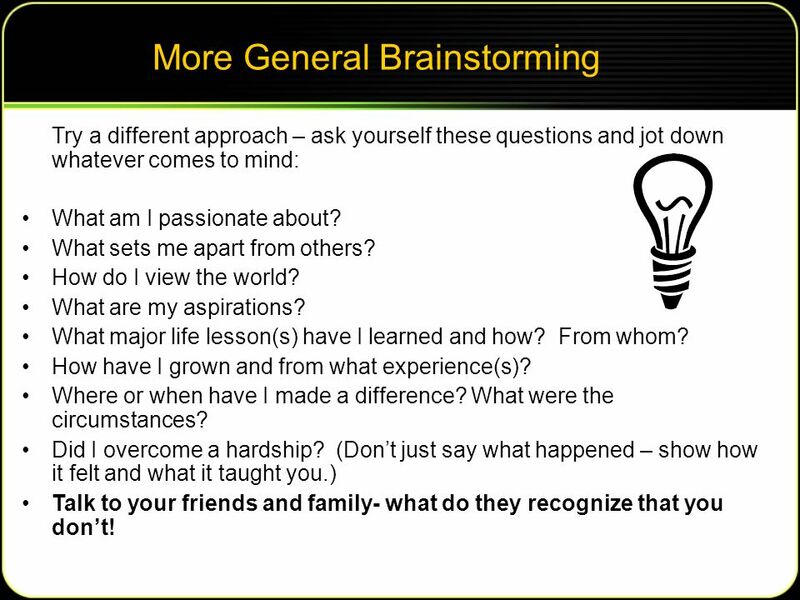 8 More General Brainstorming Try a different approach – ask yourself these questions and jot down whatever comes to mind: What am I passionate about? What sets me apart from others? How do I view the world? What are my aspirations? What major life lesson(s) have I learned and how? From whom? How have I grown and from what experience(s)? Where or when have I made a difference? What were the circumstances? Did I overcome a hardship? (Don’t just say what happened – show how it felt and what it taught you. )‏ Talk to your friends and family- what do they recognize that you don’t! 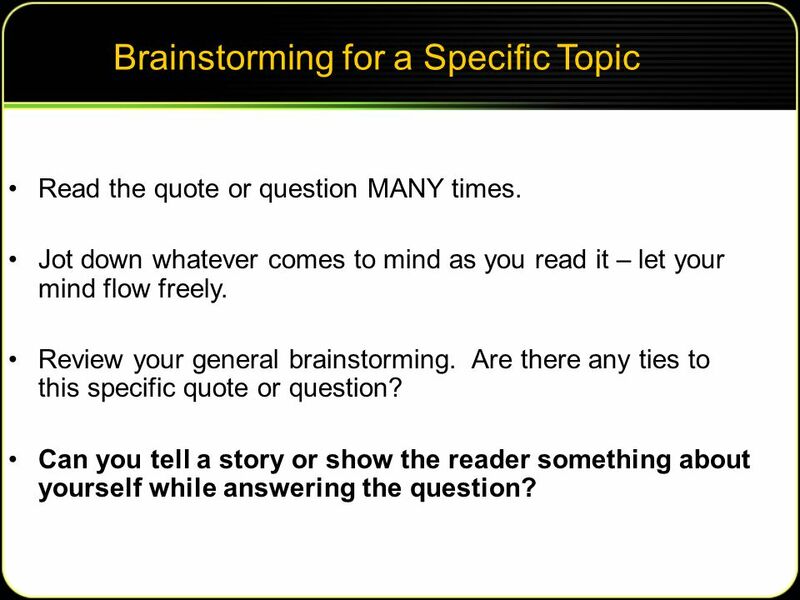 9 Brainstorming for a Specific Topic Read the quote or question MANY times. Jot down whatever comes to mind as you read it – let your mind flow freely. Review your general brainstorming. Are there any ties to this specific quote or question? Can you tell a story or show the reader something about yourself while answering the question? 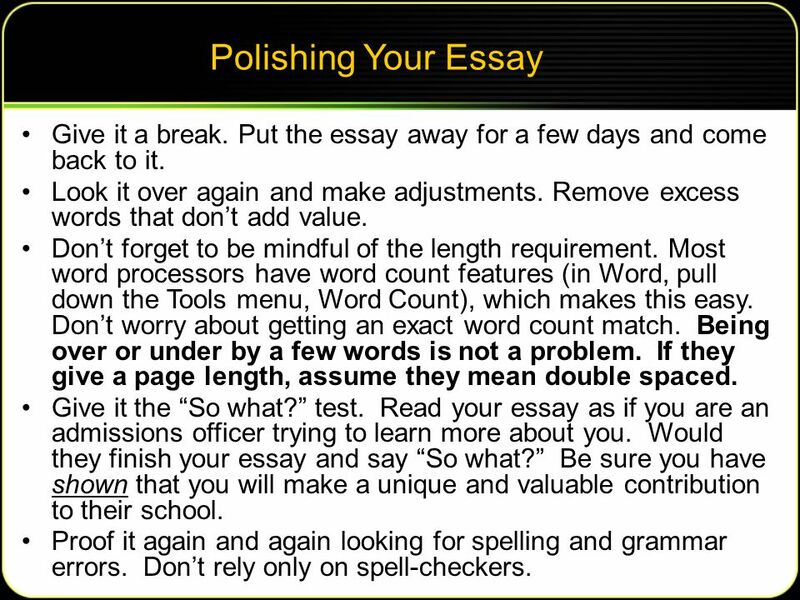 10 Polishing Your Essay Give it a break. Put the essay away for a few days and come back to it. Look it over again and make adjustments. Remove excess words that don’t add value. Don’t forget to be mindful of the length requirement. Most word processors have word count features (in Word, pull down the Tools menu, Word Count), which makes this easy. Don’t worry about getting an exact word count match. Being over or under by a few words is not a problem. If they give a page length, assume they mean double spaced. Give it the “So what?” test. 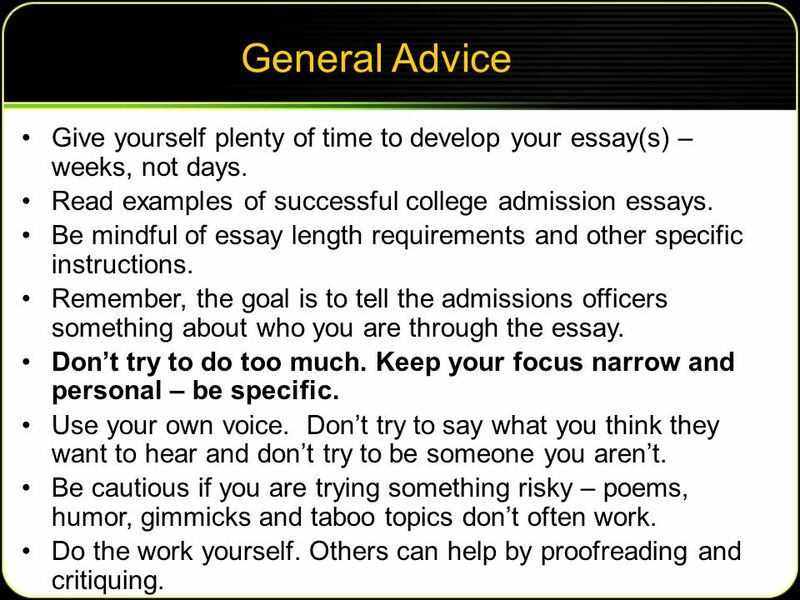 Read your essay as if you are an admissions officer trying to learn more about you. Would they finish your essay and say “So what?” Be sure you have shown that you will make a unique and valuable contribution to their school. Proof it again and again looking for spelling and grammar errors. Don’t rely only on spell-checkers. 11 Showing vs. Telling Telling (the bad)‏ Last summer I was fortunate enough to go to Costa Rica on a community service project where we helped rescue the nearly extinct Lora Sea Turtles. However, the trip had some unexpected results, for the late night hiking caused me to get horrible blisters all over my feet…. Showing (the good)‏ The pain was excruciating and I could barely walk. Mosquitoes found their way in, penetrating the netting surrounding my thin mattress. The air was motionless, exaggerating the oppressive heat and humidity in our open-air shack. As I watched the sun go down, I knew it would soon be time to make a decision about my last night in Costa Rica. See the difference? Which one grabs you? Which one evokes feelings or sensations? 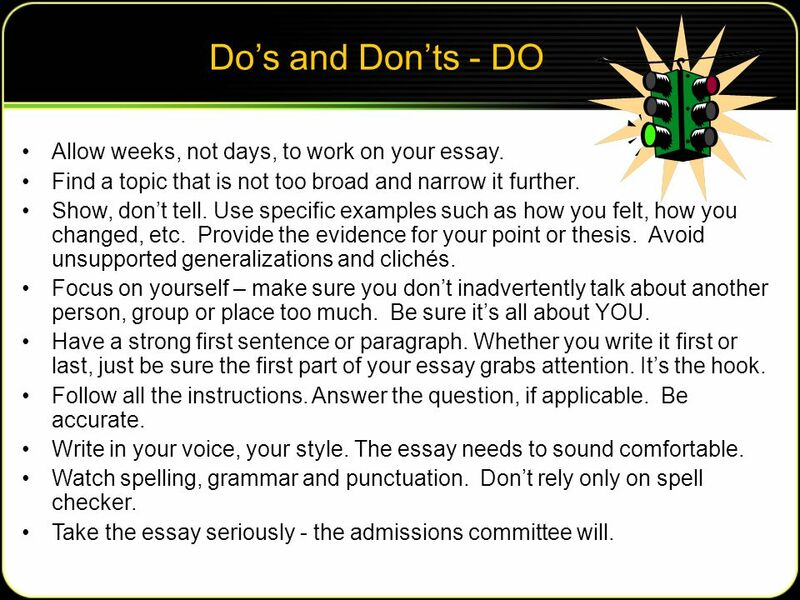 12 Do’s and Don’ts - DO Allow weeks, not days, to work on your essay. Find a topic that is not too broad and narrow it further. Show, don’t tell. 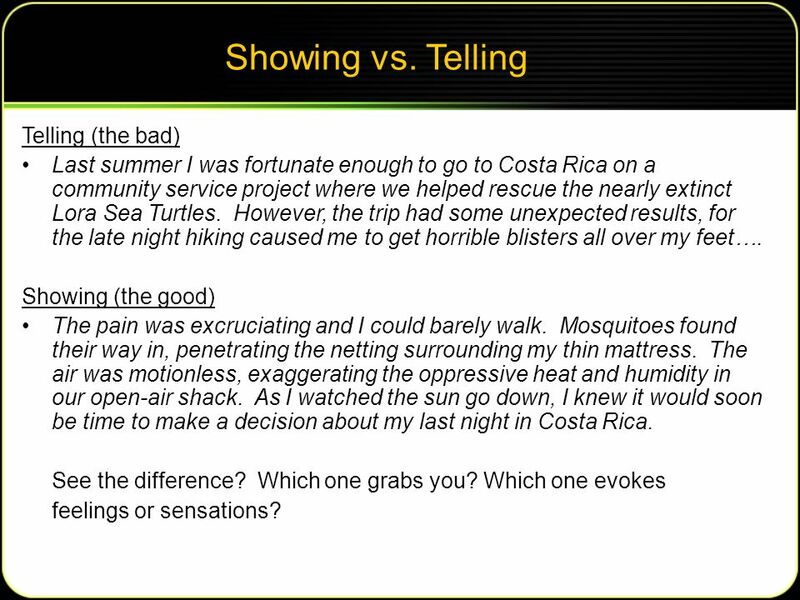 Use specific examples such as how you felt, how you changed, etc. Provide the evidence for your point or thesis. Avoid unsupported generalizations and clichés. Focus on yourself – make sure you don’t inadvertently talk about another person, group or place too much. Be sure it’s all about YOU. Have a strong first sentence or paragraph. Whether you write it first or last, just be sure the first part of your essay grabs attention. It’s the hook. Follow all the instructions. Answer the question, if applicable. Be accurate. Write in your voice, your style. The essay needs to sound comfortable. Watch spelling, grammar and punctuation. Don’t rely only on spell checker. Take the essay seriously - the admissions committee will. 13 Do’s and Don’ts – DON’T Don’t be intimidated by the task – just start. That’s the hardest part. Don’t repeat information that is elsewhere on the application. Don’t pick trite or risky topics unless you are very sure you can pull them off. 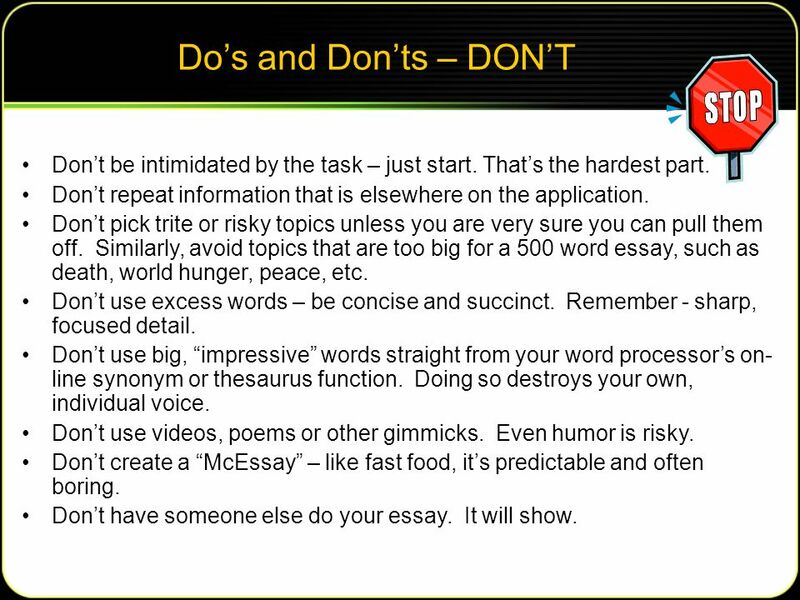 Similarly, avoid topics that are too big for a 500 word essay, such as death, world hunger, peace, etc. Don’t use excess words – be concise and succinct. Remember - sharp, focused detail. Don’t use big, “impressive” words straight from your word processor’s on- line synonym or thesaurus function. Doing so destroys your own, individual voice. Don’t use videos, poems or other gimmicks. Even humor is risky. Don’t create a “McEssay” – like fast food, it’s predictable and often boring. Don’t have someone else do your essay. It will show. 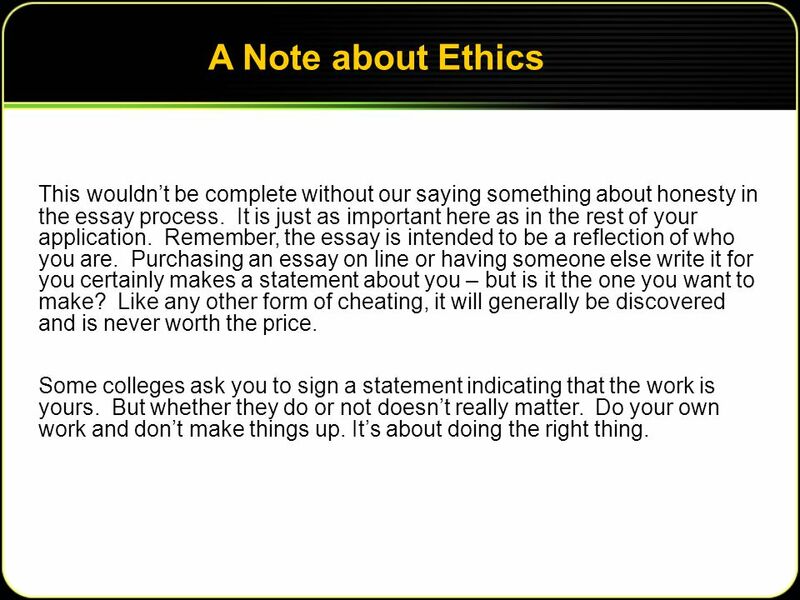 14 A Note about Ethics This wouldn’t be complete without our saying something about honesty in the essay process. It is just as important here as in the rest of your application. Remember, the essay is intended to be a reflection of who you are. Purchasing an essay on line or having someone else write it for you certainly makes a statement about you – but is it the one you want to make? Like any other form of cheating, it will generally be discovered and is never worth the price. Some colleges ask you to sign a statement indicating that the work is yours. But whether they do or not doesn’t really matter. Do your own work and don’t make things up. It’s about doing the right thing. 15 You Can Do It!. Believe it or not, the hardest part is just getting started. 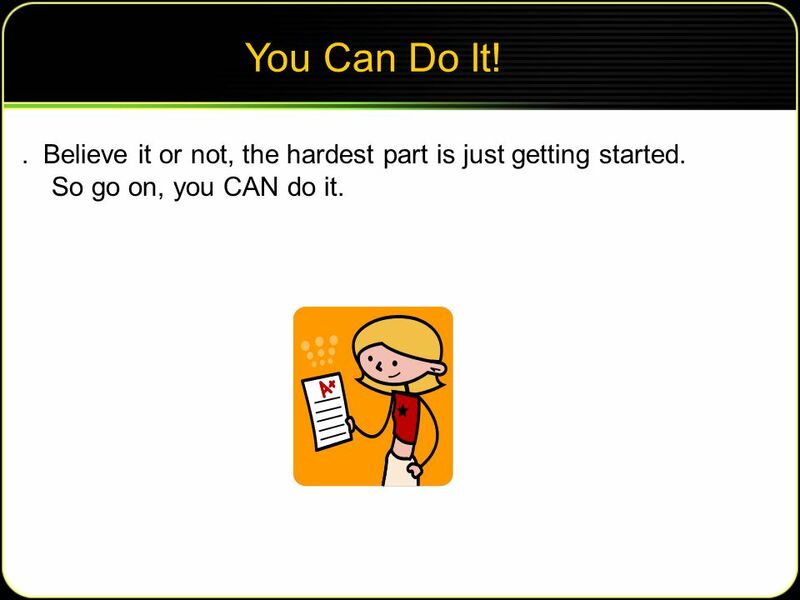 So go on, you CAN do it. 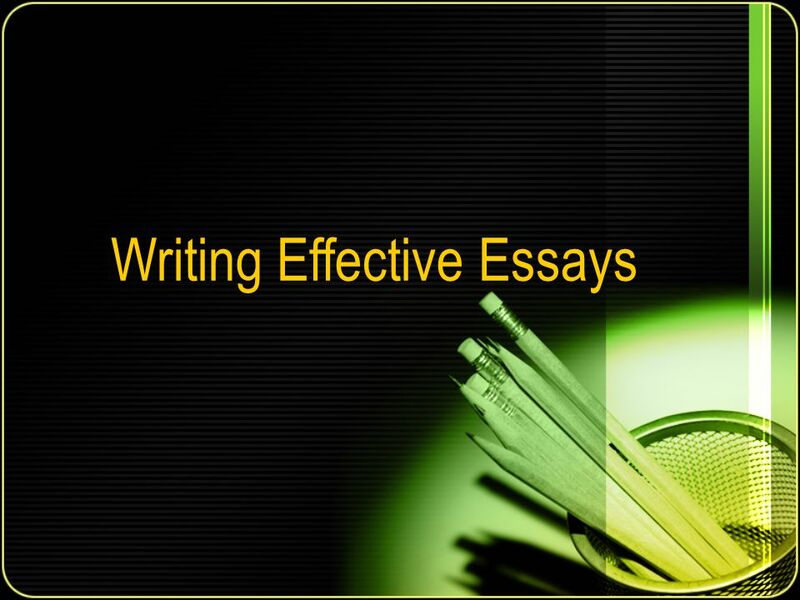 Download ppt "Writing Effective Essays. Why Colleges Ask For Essays College admission committees read thousands of applications, and most of the content reduces the." What Can I Do About Teasing? Essay Writing Excerpts Taken from Gloria Mueller (College Consultant), Janet Raplye (Princeton), Ted Spencer (Michigan): Faculty Members at the Harvard. THE ART OF THE COLLEGE ESSAY COLLEGE PLANNING NIGHT PRESENTED BY ALEXIS MASON GIFTED RESOURCE TEACHER ALBEMARLE HIGH SCHOOL. College Admissions Essay: Writing Workshop College Club Fall 2010. College Admission Essay. Topic A Describe a setting in which you have collaborated or interacted with people whose experiences and/or beliefs. The road to success starts with you! 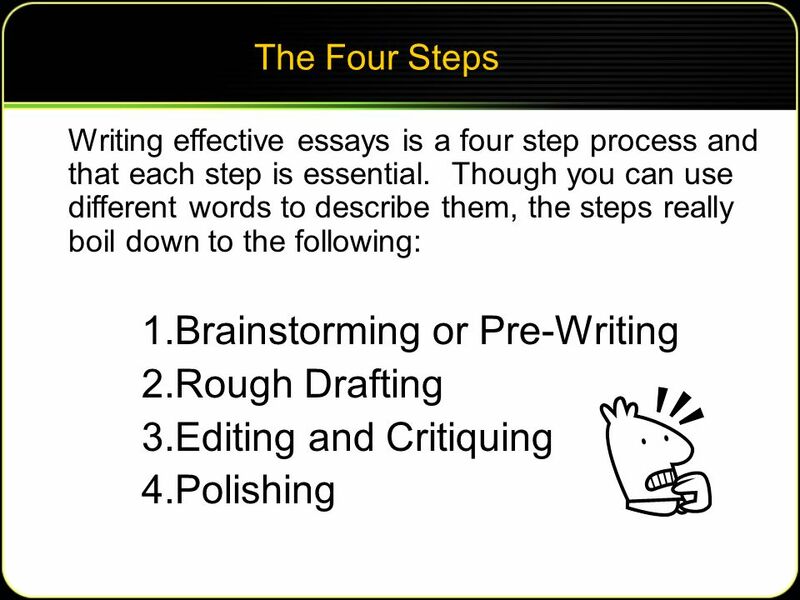 Montana University System Office of Student Financial Services (SFS) TIPS TO WRITING A GOOD SCHOLARSHIP ESSAY. Writing the College Application Essay Ms. Calhoun AP English Literature/English 4 La Cañada High School. Your purpose in writing a personal statement is to explore the connection between a personal experience and what it says about your life and about the.